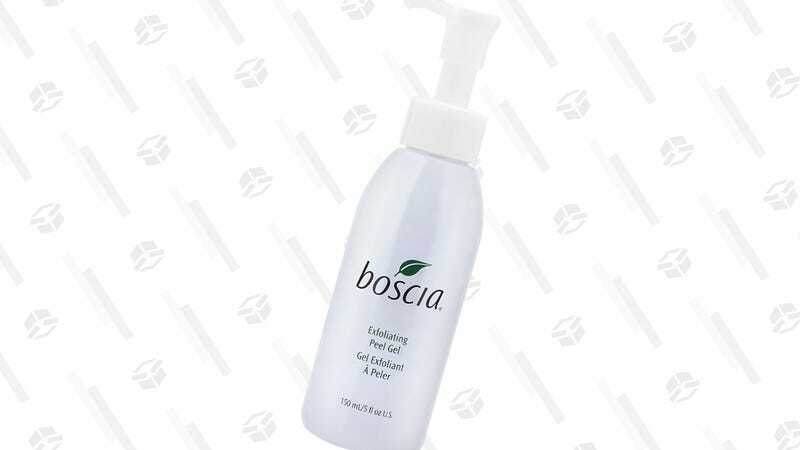 Why Didn't Anyone Tell Me That The Boscia Exfoliating Peel Gel Was So Good? Last year, it seemed like for months, the trend was gel exfoliating peels. I devoured videos of people’s face skin balling up like eraser shavings. But then came the take-down articles and before I could purchase some for myself, the gimmick came and went. But, as I was cleaning out my bin of beauty samples, I found Boscia’s Exfoliating Peel Gel in a small bottle at the bottom. I thought, “Hey, this is free and if I hate it, I can just toss it out.” Well, TL;DR: I didn’t hate it and I will be buying a full-size bottle as soon as my sample bottle runs out. What really drew me into the Peel Gel was the sensation that you are rubbing your skin off like a peeling sunburn. Supposedly, the gel attaches itself to the dead skin cells and basically, well, peels it off into little tiny balls. It looks almost like lint, or sweater pills, scattered across wherever you rubbed. I tried it out on my nose first, and to my amazement, and slight horror, it worked. My nose was noticeably less shiny and smoother. A lot of my sebaceous filaments looked tamed, which is an honorable feat to achieve. In my mind, the jury is still out on how this actually works (if at all). But, as someone who fairly regularly does a chemical exfoliation as part of a skin care routine, the option to switch it up to something a little more viscerally satisfying is a huge win. It’s all the fun of a physical exfoliant without the harsh, scratchy ingredients. I did try another layer to see if it was just the product balling up on my skin and it did nothing on my nose after I washed off the first layer. It’s a mysterious goo that I will continue to use on days I don’t feel like waiting 10 minutes for my AHA + BHA peel to dry.